An inmate bolted out from San Ramon Prison and Penal Farm sometime in the late 1980s. And what unfolded thereafter is an interesting story of someone who lived under a shadow of trepidation and dread, familial bonding and angst. The escapee was carrying a penalty of six years as minimum up to twelve years maximum for homicide. He was insisting in his defense that he was not responsible for the death of his friend but the court ruled otherwise. A few months of trial, the verdict was issued and the sentence promulgated. He was shipped to the farthest prison in the country, also the oldest, San Ramon Prison and Penal Farm in Zamboanga City. Deep in his heart, he was never guilty but he was so poor that he could not get the proper defense for his innocence. He merely waited for time to vindicate his name. He would write his sister most of the time. She knew the truth. Let me call this fellow by his institution name, Raul. His prison number, which is supposed to be his name tag, was long and sounded confusing hence the common name. 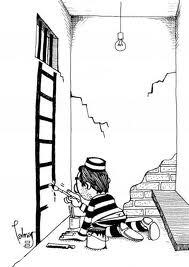 Raul tried to get his hand in any prison activity even if it meant that he must have to enslave himself to learn. For a semi skilled farmer, carpentry work is just as exciting. He can fashion out something which can be useful to his friends, his superiors and cellmates. He was a serious apprentice until he became proficient to the point that he would be allowed to move out of the penal facility to repair officer’s quarters. Skilled prisoners however are often targets of intrigue until one day; he learned that some officers were annoyed at him for skipping errands in favor of another officer. Those who have achieved adeptness in a skill are required to attend on all tasks dictated and failing to attend even on such trivial concern would render his situation perilous. He would oftentimes fell sick because of fatigue and when he learned from his buddy that he was being set up for another charge, a situation which befell him previously, he decided to escape. After all, there was no security monitoring his movement. He walked leisurely out of the camp into the gates and since no one noticed him pass through, he was able to flag down a motorcycle service which took him to the pier. From there, he tried to pose as a stevedore, assisting passengers lift and organize their baggage until he came off naturally as an ordinary passenger. Honest as he was, he went straight to the captain to plead for compassion, volunteering to do any chore for the officer just to be allowed to travel without glitch. He literally enslaved himself doing menial jobs much like in prison. In his mind, at least once they reached the port, which means a few days; he would be out in the open like any freeman. The travel took a full week, enough for that which he saved from tips of officers he had served. He tried to be helpful and obliging in his journey that in no time he was able to reach the residence of his sister. The reunion with her sister was full of drama. But the sister could not help her brother because her family was impoverished. He asked for a small space from her sister’s lawn and there he built a small shop. He was a good carpenter and he tried to project competence by showing off his skill. From surplus lumber he gathered from street corners and hardware stores, he was able to assemble and display window sash and awning. In a few weeks, his stall would be visited regularly by prominent and affluent customers. In just a few months, he could assist her sister in solving her economic woes and he would even procure the lot adjacent the small corner he borrowed from her sister. A few years after, his business would reap success that he began to teach his brother in law the techniques of the craft until her sister’s family began to establish their own carpentry shop. The enterprise would grow leap and bounds until their area in the neighborhood would become virtually a Mecca for designer window supplies. He knew that their commerce would collide eventually and would figure head on into a competition. He closed his shop and offered to join her sister’s husband so that the business would be stronger as a singular effort but his sister declined. One day, while he was busy designing window joinery, a police car suddenly appeared in front of his shop. With an arrest warrant, Raul was instantly taken into custody. Someone tipped the police on his true identity. He was quickly detained and the precinct lost no time contacting the penal authorities on the identification of the person they apprehended. True enough, he was a fugitive, an escapee from San Ramon prison and at large for almost a year. He learned that his brother in law disclosed to the police his status as a prison renegade and a dangerous person on the loose. But Raul, ever the amiable man that he is, impressed on his captors that he was never a dangerous person. He volunteered to help in renovating the police precinct until the lowly facility was adjudged as the best maintained police unit in the whole Rizal province. For three months under detention, he was able to refurbish and remodel the station using those materials he left. After all, he had nothing to leave the materials and tools he accumulated. He never displayed any lamentation or regret for what his sister’s family had done to him. For him, it was merely competition that drove his brother in law to betray him to authorities. He merely accepted his fate. The police authorities, impressed at their volunteer worker and detainee that they pledged to take up his cause and assist him so that he will be properly treated. A police delegation went to the national penitentiary and asked for technical assistance regarding the person they apprehended. Prison authorities immediately took up the matter and guided the officers to bring the fugitive back into the prison camp so that the case will be immediately evaluated. The police surrendered the fugitive the next day. His case was assessed. Since San Ramon Prison never filed a case of evasion against the escapee and that during the period while he was on the lam which took several years without any record of infraction or complaints, his case merited prescription. The day Raul was brought to the penitentiary for readmission, was also the day, he would be receiving his release paper. His police handlers were a picture of jubilation. They could not fathom the luck that their ward received that day. That day they were educated on the rule that there is such a legal principle where a fugitive who made good may still find the spirit of law favoring his star. While waiting for their favorite captive, a letter was received coming from Raul expressing gratitude for the trust and confidence he received from them. It was a correspondence written by a grateful person about to leave for some places unknown. That day, the escapee has embraced real freedom and possibly embarked on a journey that would take him to another place where he could start life, however late, all over again. Posted on September 8, 2012, in Uncategorized and tagged carpentry work, deep in his heart, penal farm, travel, trivial concern. Bookmark the permalink. 9 Comments. Hi there, I discovered your blog via Google even as looking for a similar topic, your web site came up, it seems great. I have bookmarked it in my google bookmarks. Great post at THE ESCAPEE PRISON WATCH. I was checking constantly this blog and I’m impressed! Extremely helpful info specially the last part 🙂 I care for such info a lot. I was seeking this particular information for a very long time. Thank you and best of luck. Good ¡V I should certainly pronounce, impressed with your website. I had no trouble navigating through all tabs as well as related info ended up being truly easy to do to access. I recently found what I hoped for before you know it in the least. Reasonably unusual. Is likely to appreciate it for those who add forums or anything, website theme . a tones way for your client to communicate. Nice task..